That’s right, it’s that time of year for a crochet-along and boy do I have a good one for you. 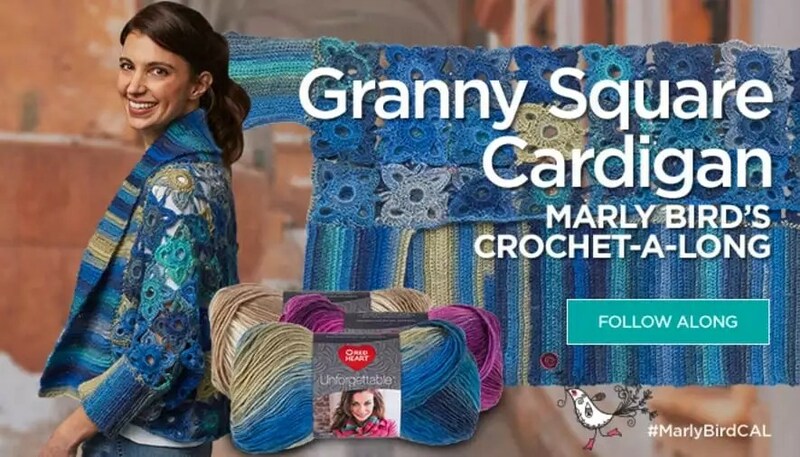 Welcome to Section 1 for the Marly Bird Granny Square Motif Cardigan Crochet-along. Cocoon measures 48 (56, 64)” (122 (142, 163) cm) in width including cuffs, and 21½ (25, 28½)” (55 (64, 72) cm) in length not including collar. Please make a note that the schematic only shows the dimensions of the body of the garment, it does NOT include cuffs or collar! 1 Motif = 3½ x 3½” (9 x 9 cm) CHECK YOUR GAUGE. Use any size hook to obtain the gauge. Below you will find the Marly Bird Granny Square Motif Cardigan SECTION 1 instructions. You have a choice to follow along with the written pattern or the chart for the crochet motif and the join as you go motifs. Both are provided for you. Ch 10, and slip st in first ch to form a ring. Round 1: Ch 3 (counts as 1 dc), 23 dc in ring, join with slip st to 3rd of beginning ch-3 – 24 dc. Round 2: Ch 1, sc in same st as joining slip st and in each of next 2 dc, (sc, ch 7, sc) in next dc, * sc in each of next 5 sc, (sc, ch 7, sc) in next dc; repeat from * twice more, sc in each of last 2 dc, join with slip st in first sc. Round 3: Ch 1, (sc, ch 7, sc) in first sc, * skip 3 sc, (7 dc, picot, 6 dc) in next ch-7 space, skip 3 sc, (sc, ch 7, sc) in next sc; repeat from * twice more, skip 3 sc, (7 dc, picot, 6 dc) in next ch-7 space, skip 3 sc, join with slip st in first sc. Rounds 1 and 2: Work same as first Motif. 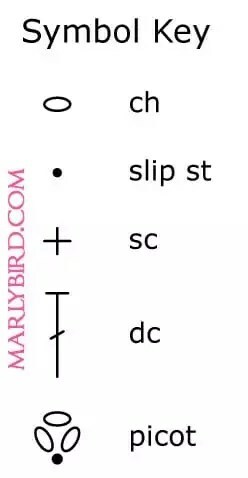 Round 3: Ch 1, (sc, ch 7, sc) in first sc, skip 3 sc, 7 dc in next ch-7 sp, ch 1, slip st in corresponding picot on adjoining Motif, ch 1, slip st in last dc made on current Motif, 6 more dc in same ch-7 space as last 7 dc made, * skip 3 sc, sc in next sc, ch 3, sc in corresponding ch-7 space on adjoining motif, ch 3, sc again in same sc as last sc made, skip 3 sc, 7 dc in next ch-7 sp, ch 1, slip st in corresponding picot on adjoining Motif, ch 1, slip st in last dc made on current Motif, 6 more dc in same ch-7 space as last 7 dc made; repeat from * for each edge to be joined, then complete Round 3 same as first Motif. Designer Tip: WEAVE IN YOUR ENDS AS YOU GO! Do not wait until the very end! ch = chain; dc = double crochet; sc = single crochet; st(s) = stitch(es); * or ** = repeat whatever follows the * or ** as indicated. Follow this chart for the Marly Bird Granny Square Motif Cardigan just as is written in the pattern. 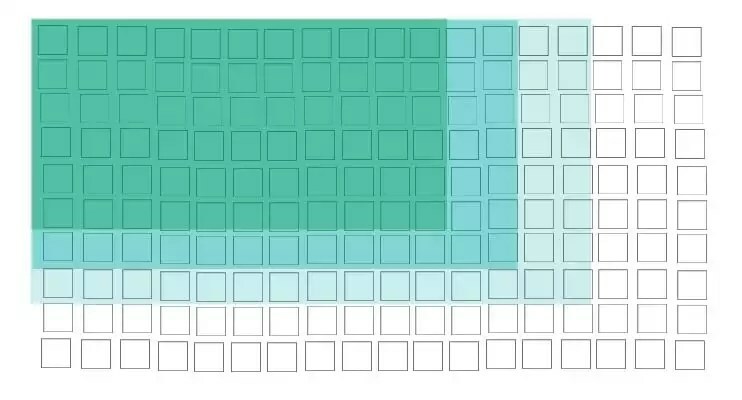 Make 1 full square, then join the remaining squares to the completed square(s) in round 3 as indicated in the chart. Each round of the motif is a different color on the crochet chart to make it easier to see what stitches are used for each round. Green Arrow-points to where the joining motif will be joined to the already made motif(s). 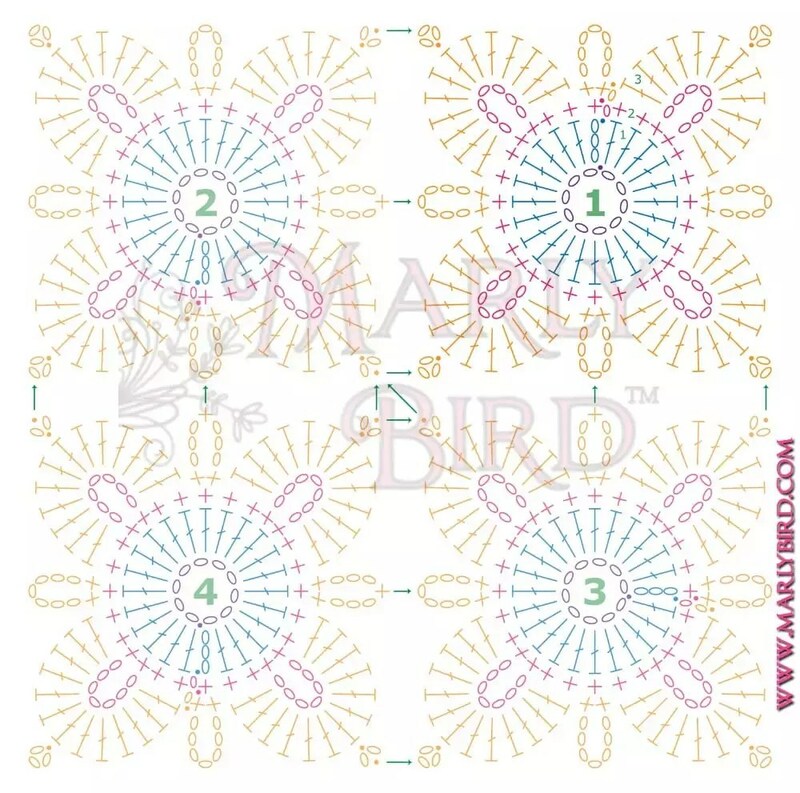 I am also including a chart below that has the full image of the Marly Bird Granny Square Motif Cardigan crochet joining squares because I know some of you like to see full motifs vs the partial bit that is getting joined. Please note, this is the same chart/same process as the chart above. 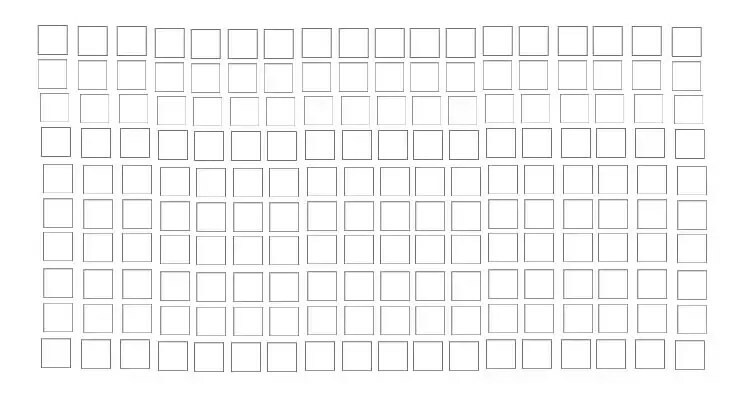 These charts are here to help you decide how many squares you need to make for your cardigan. I explain how to use them in the Video #2 for the CAL (it is below). You wouldn’t believe how difficult it is to film, read a chart, crochet, and talk at the same time. LOL. Having said that…I had one little flub up on the videos. Heads up, At 17:22 I meant to say ‘chain 3’ not ‘chain 7’. I recommend learning this new motif with stash yarn first, then do another motif for your actual cardigan to measure gauge. Do not forget that it is a MUST that you get the correct gauge on your squares or you will have to make mathematical adjustments to the pattern. Because I know you are going to ask…if you start on Sept. 6th, you have 21 days to get all the squares of the cardigan complete. Ready, Set, GO! Once you finish your section be sure to post pictures to the facebook group as there will be a prize given away from RedHeart.com to one lucky person (who is randomly chosen) that has finished his or her homework during the week of Sept. 6, 2017 – Sept 12, 2017 @ 11:59pm MDT. Goodluck! Although my preference is written instructions, this is teaching me how to read and use charts, so thank you! Thank you, too, for the full chart. It makes it much easier to see how to attach each motif as you go. I had some of this yarn left from a previous project, so am practicing with that. Now if my ordered yarn would get here before the 11th! Or maybe I will go get more of this color at WM and make two. I am having trouble with my gauge. I get 3″ with a 4 hook. The instructions for the cuff mentions a second marker but the only marker placed Is at 9 inch (center) on each end, HELP!